My 2017 race season ended (fairly spectacularly) with RnR Las Vegas. I had already started training for 2018 by November. 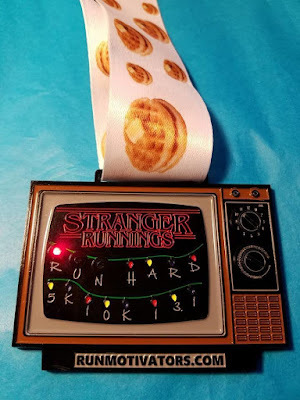 Since we typically have a lot of cold and snow in these parts I decided to add a few virtual races into the months of December and January just to keep things interesting. No set start time or location - you choose. It could be on the treadmill at 11 pm or out on a trail at 7 am. Easy to fit with a training schedule. Even though each race has a distance(s), you can still extend your run if you feel good. There's no finish line! I've done 30k for a virtual before, it gives that little bit extra motivation. Vegas Strong just raised $65,000 for the victims of the shooting - you are running for a reason and spending time thinking about that reason. Operation Jack is another great cause, I've also done the 'actual' race before, read about it here. Your time is not all over the internet. It is your choice to share and/or upload if that is offered. I'm not focused on time right now at all, my next race will be long distance and I'm not speed training or breaking any records. There's no stress! I like shiny things. I like running and being rewarded with those shiny things. That's my plan right now and I'm really enjoying it. A lot of serious training tends to get on top of me so this makes it fun and running should be fun.